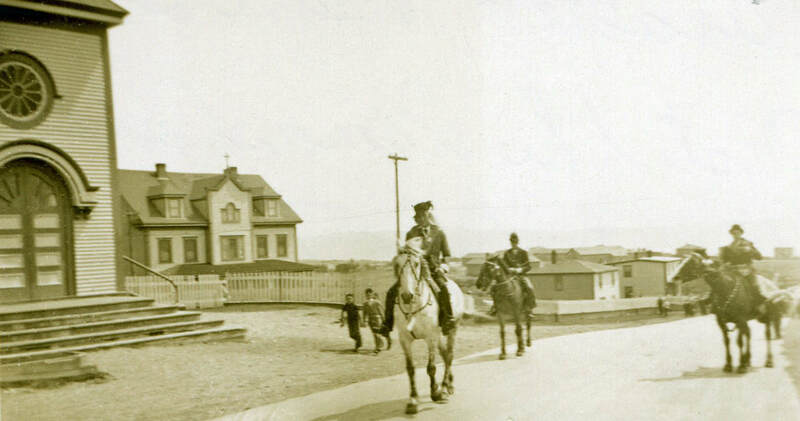 a Memoir of Newfoundland in the Nineties, Part 2"
Thomas Anthony Power (1882-1959): Rancher and County Judge in Oregon, USA. He was born on Bell Island February 2, 1882, the third child of Louisa (Anthony c.1844-1888) and Thomas Power (c.1838-1888), who had inherited a large farm of "several hundred acres" at The Front when his father, Thomas (c.1793-1882), died. Thomas Anthony was six years old when his parents both died in 1888, and he and his five siblings were then raised on the family farm by their Aunt Kate (Catherine Power, 1834-1910). They lived just east of what was then a Roman Catholic mission chapel, later rebuilt as St. Michael's Church, and today is the site of St. Michael's High School. The land for the church property had been a donation of the Power family. In 1897, when he was 15 years old, this third-generation Thomas Power left Bell Island for Boston, where he continued his education. 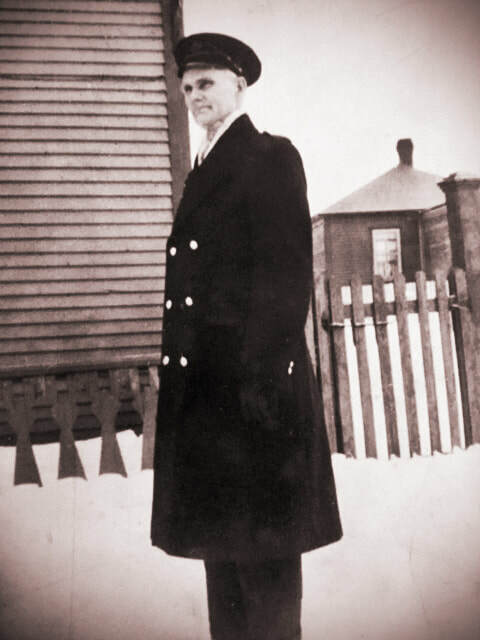 Striking out for the American West, he worked as a telegrapher and signal maintenance manager for the Santa Fe Railroad and briefly on the construction of a new railroad line in Alaska. In 1911, he staked a land claim in the foothills of the Ochoco Mountains in Central Oregon, where he developed a sheep and cattle ranch. He served as a Commissioner of Jefferson County in the 1930s and as County Judge from 1941 until 1953. During World War II, he was chair of the USO Council in Madras, chair of the War Price Rationing Board, and chair of the Keep Oregon Green Association in his county. You can read more about Thomas Anthony Power's life at the beginning of Part 1 of his "Belle Island Boyhood." You can read about some of the earliest recorded members of the Power family on Bell Island on the "People" page in the top menu. ​Here now is Part 2 of Thomas Power's memoir of growing up on a farm on Bell Island in the 1880s-90s. The photo below of the Orangemen's Parade c.1950 was taken in front of St. Michael's RC Church on Memorial Street looking east over the area that was Power's Farm in the 1800s. Photo courtesy of A&SC, MUN Library. Other than what you have already seen in the above story and in Part 1, not a lot of details are known of Thomas A. Power's immediate family. Newfoundland Vital Records tell us that his Aunt Kate, Catherine Power, who raised him and his siblings following the deaths of their parents in 1888, died of "old age" May 13, 1910 at age 76. She is buried in the Roman Catholic Cemetery at The Front, Bell Island. Her death came just a year after Lucy, the youngest of Thomas' siblings, left Bell Island to study nursing in the United States. It was reported in the Daily News in May 1913 that "Miss Lucy Power graduated with honours from the Boston City Hospital and went to Oregon where her brother, Thomas, had a farm. She had left Bell Island in 1909 and had spent some time working in the Maternity Hospital at Providence, Rhode Island." On September 9, 1914, Lucy Power married Ferdinand Konrad at the Cathedral of the Immaculate Conception in Oregon. Below is a photo of William Power, older brother of Thomas A. Power, who wrote the story of his "Belle Island Boyhood." ​William was born on Bell Island in 1880, the second child of Louisa (Anthony c.1844-1888) and Thomas Power (c.1838-1888). William was 8 years old when his parents both died in 1888, and he and his five siblings were then raised on the family farm by their Aunt Kate (Catherine Power, 1834-1910). One of William's jobs in his younger years was reading the telegrams received at The Front Post Office, as he was one of only a few people in the area who could read in those days. In 1905, he married Mary Hogan (1879-1933) of Harbour Grace, for whom he wrote many poems. Mary died September 22, 1933 of a heart attack. William's first career was a Mechanic/Engineer for DISCO until the early 1930s, when he became a Customs Officer. He died in 1964. He and Mary are buried in the Roman Catholic Cemetery, The Front, Bell Island. Sources: Vital Statistics; Thomas A. Power, "Belle Island Boyhood," in NQ, V.85, No. 2, Fall 1989, pp. 20-28; John S. Power, Personal Interview, July 15, 1991; Bonita Power, granddaughter. Photo courtesy of Bonita Power.